The role of the Sun, planets and stars and their influence on global markets is intriguing to traders and investors alike. Christeen Skinner�s research shows very definite links between major stock market movements and the position of the planets. This book will be of interest to those with little understanding of astrology as well as to those well-versed in the subject. The work includes charts, graphs and horoscopes and explanation of some of the techniques used for astro-financial forecasting. 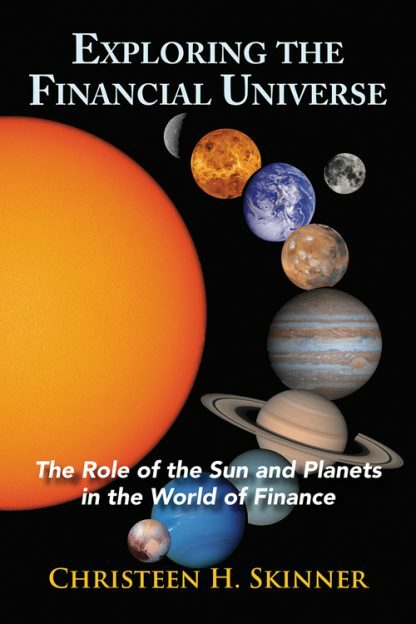 In Exploring the Financial Universe, financial astrologer Christeen Skinner covers solar rhythms and the intricacies of commodity, property and currency price movements with planet cycles. The role of the planets in mastering the relationship between time and price is considered. There is a chapter on the natal horoscope and financial rhythms set from birth. The book concludes with forecasts covering 2017-2024. The author presents case studies in business astrology and an explanation of some astro-finance trading techniques and uses financial charts taken from the Market Analyst software program for astro-traders. Christeen H. Skinner is a practicing astrologer and the director of Cityscopes London, a company specializing in future casting. She holds a diploma from the Faculty of Astrological Studies where she also taught for a decade, and she was the chair of the Astrological Association of Great Britain. Christeen offers a free monthly newsletter service now in its 8th year.